On March 16, 1900 the eldest son Friedrich Klopp (1875 – 1946) married in Wolmirstedt the 20-year old seamstress Auguste Louise Weihe (1880 – 1924) from Zielitz. Two months after the wedding his father, Peter F. Klopp died. 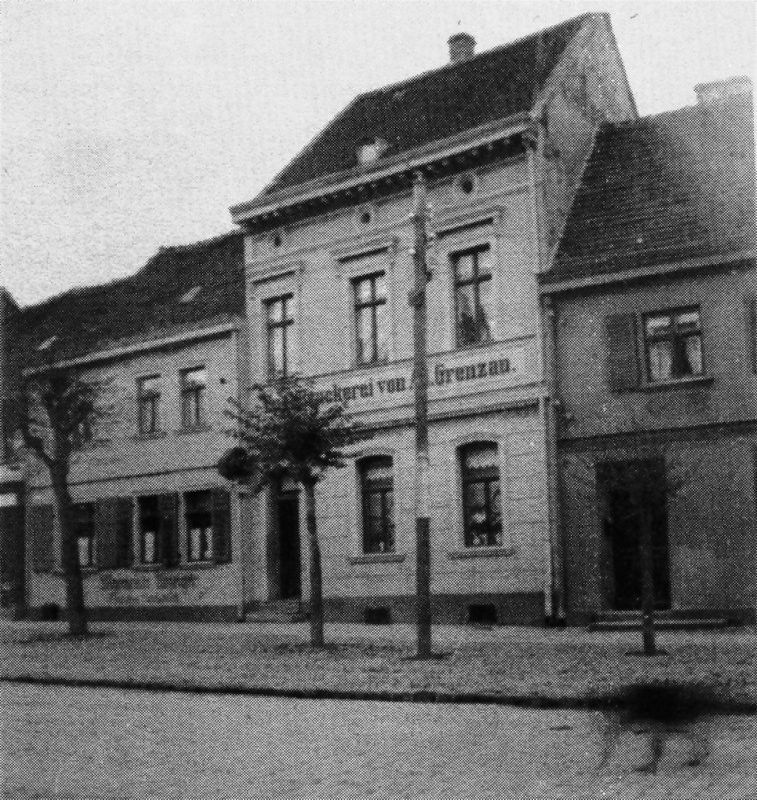 The house at Magdeburg Street 16 (today Friedenstr. ), which his father had acquired around 1890 did not fulfill the hopes for a prosperous middle class existence of the two family branches. 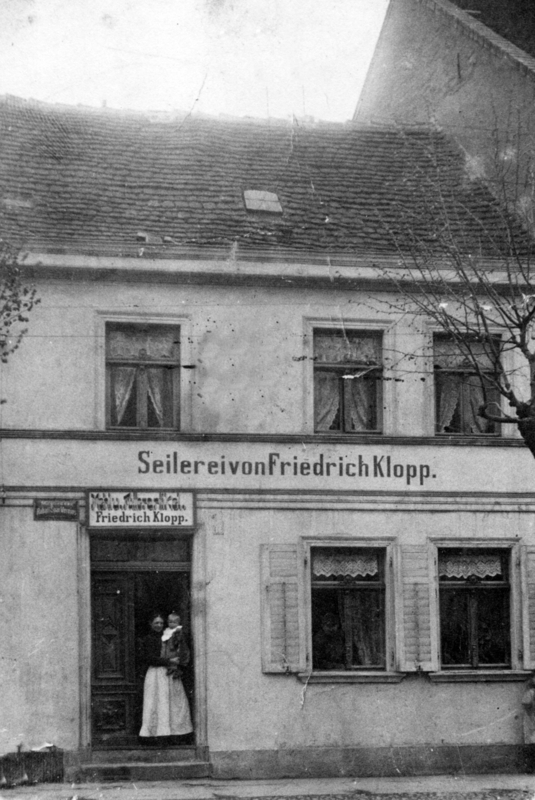 It appears that Friedrich had already set up shop in this house in 1898 right after his military service. For his sister Meta Emma (1898 – 1984) was not born here, but in Jersleben. Already before the sale of the water-mill, Friedrich Klopp had built in 1902 an addition to the backside of the house. The new construction contained two floors. The kitchen and the living room plus two small bedrooms were located on the ground floor. A hallway and a stairway led to the upper floor with two more bedrooms and two additional rooms. The largest room was only 15 sq m in size. The new addition had a height of 5.6 m and a slanting roof. Seven or eight people could be accommodated here. The outhouse stood in the yard at the fence close to the neighbor’s garden. Friedrich had intended the addition to be used by his mother Emma and her children, while he reserved the much larger house at the front for his rope manufacturing plant and his own small family of three. Looking at this rather unfair living arrangement, we may see the root cause of the ensuing family feud. Being treated in such an undignified manner, Emma stayed at most 18 months with her eldest son in Wolmirstedt. When Friedrich and his pregnant wife took over the house in 1900 at the latest, mother Emma’s plans and her very basis for a comfortable existence within the family were severely shattered. The acquisition of the water-mill turned out for her to be merely an emergency solution, which was for a while financially sustainable. For Emma worrisome years followed. While Ferdinand, one of Friedrich’s younger brothers, was in the United States more or less successfully exploring efficient flour production methods, widow Emma suddenly saw herself confronted with unexpected hostilities.